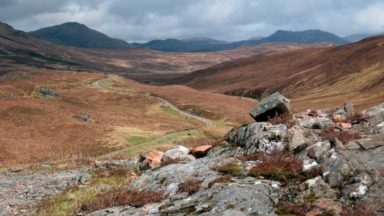 The 215km John Muir Way (Scotland) invokes the spirit of the young naturalist, whose lifelong mission to protect nature and wild places was founded during his clandestine trips into the Scottish countryside. John Millen from our friends at Sherpa Expeditions tells us about the route. I walk round a rocky corner of sandstone cliffs, spray exploding way below and the sea pinks blustered by the wind like corals in a current. 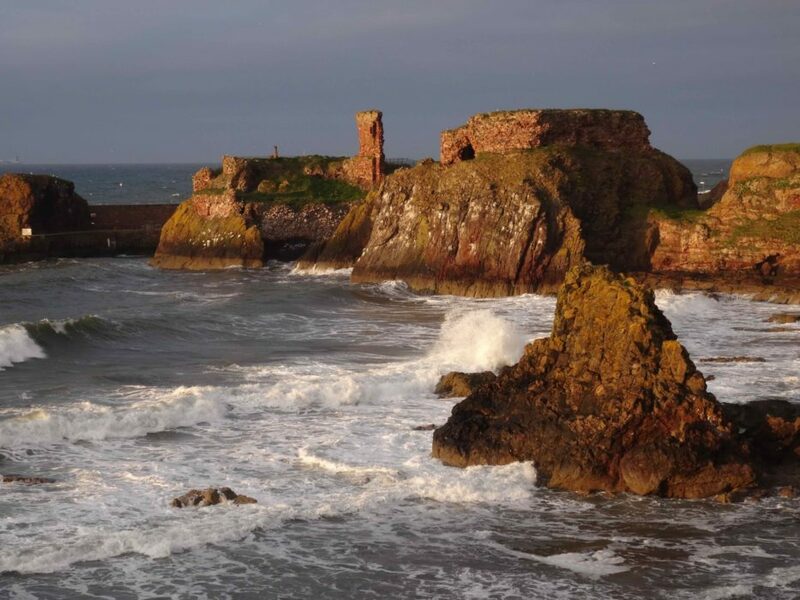 Ahead are the remains of Dunbar Castle, looking like a natural geological feature sprouting from the cliffs. A castle that withstood siege after siege, before it finally succumbed to the elements. I head into Dunbar high street, reaching the white terrace house that was John Muir’s birthplace and is now a museum, distinguished by not only the Scottish Saltire, but the Stars and Stripes flapping by the windows. It was here that the great, bushy bearded man was born into a strictly religious household in 1838. After a couple of years the Muir family moved to the house next door, which still exists, and it was from there that John made his flights of fancy from bedroom windows into the Scottish countryside. It has been a rather long (130 mile/215km) pilgrimage along the John Muir Way to discover the former home of a little boy who was destined to found the Sierra Club, convince politicians to create the Yosemite National Park and who raised the cry for conservationism and environmentalism decades before it was fashionable to do so. 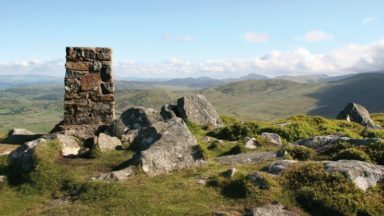 Opened on his birthday – 21 April – in 2014, the new John Muir Way long-distance walk replaces a shorter one of the same name and rather than being a traditional cross-mountain hike, it is a historical journey. The coast-to-coast route crosses Scotland from Helensburgh on the Clyde, from where the whole Muir family emigrated to the US when John was 11, then around the southern end of The Highland Fault, undulating through the Scottish lowlands of farms, canals and former industrial towns to track along the Firth of Forth, threading through Edinburgh and then down the North Sea coast, passing golf courses and bird reserves on the way down into Dunbar. 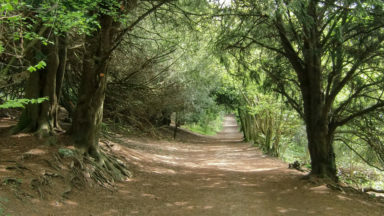 The enjoyably varied route follows a mixture of seaside, river and canal side paths, with some forestry walking for good measure. 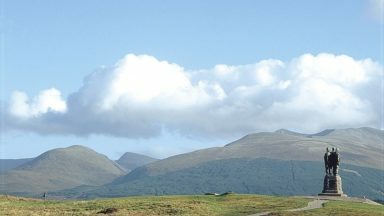 Altogether the John Muir Way links together some fine landscapes, countryside and places of historical and natural interest. 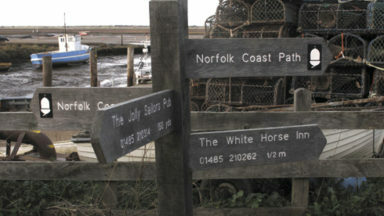 It is really well marked, with routes for walkers and cyclists that converge and diverge at various points. The accommodations and baggage transfers for my walk were conveniently set up by Sherpa Expeditions. Easily connected with bi-hourly trains direct from Glasgow, I head off to a showery Helensburgh, once home to around a quarter of Britain’s millionaires and the site of the world’s first steam ship ferry service, which started here on the Clyde in 1812. Bent double against the squall, I head up along leafy boulevards visitingHill House, now in the care of the National Trust for Scotland, a domestic masterpiece of the famous Scots architect Charles Rennie Mackintosh. Following on into plantation forest, the walk passes under Ben Bowie, before descending via an old coffin route lined with beech trees into Balloch, a pretty boating town at the southern end of Loch Lomond. The sun breaks through and the view across Loch Lomond to Conic Hill on the West Highland Way is very clear. The rain has passed through and there will be only one more afternoon of rain on the whole 10 days of the John Muir Way. From Balloch you can go for a cruise on the loch or visit the Trossachs and Loch Lomond National Park HQ. 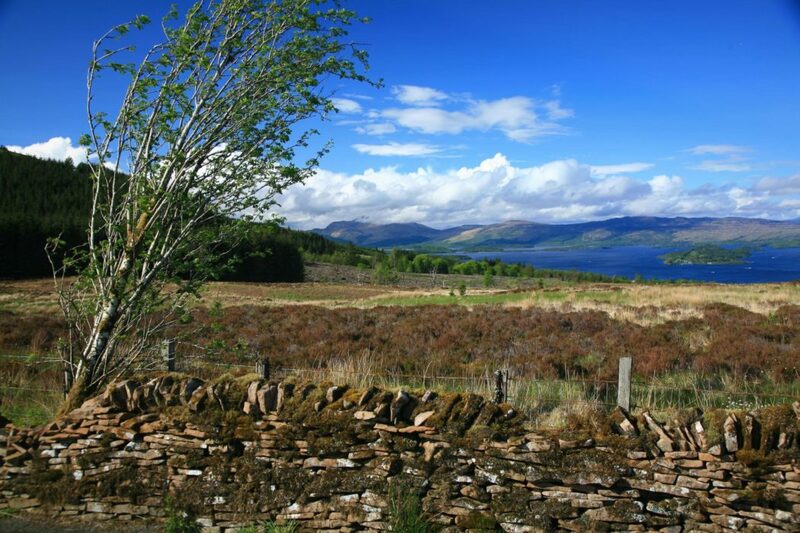 It is busy by the loch but the next day I pour through a bucolic landscape of farms and hedgerows bursting with spring blossom with views to Ben Lomond. The first half is mostly quiet road walking, then there is a new all weather gravel trail that sweeps out of the forest and around the Burncrook reservoir, a pretty spot for lunch with bellowing cotton grass speckling the view back towards the highlands. This is already the highest point of the whole route on the second day! Soon I am descending through a pretty mixed woodland park-type landscape dotted with an assortment of homemade houses of the ‘Garbeth Hutters Association’. After World War I, the local landowner, Barnes Graham, gave land to returning soldiers to enable them to build summerhouses and get some fresh air away from Glasgow. They are built from everything from fish crates to plundered timber. After a night in a hotel in Strathblane, which was venue of the secret correspondence between King James VI of Scotland and Queen Elizabeth I of England that eventually led to the Union of the Crowns, gorgeous weather accompanies me as I walk out along Strathkelvin Railway Path. It’s a largely flat day through what was quite an industrial area. The John Muir Way joins the Forth and Clyde Canal at Kirkintilloch and passes through beautiful field s before a sudden steep climb over Bar Hill fort on the The Antonine Wall.The wall was built from AD142 to 144 and ran for 37 miles (60km) from Bo'ness on the River Forth to Old Kilpatrick on the River Clyde. 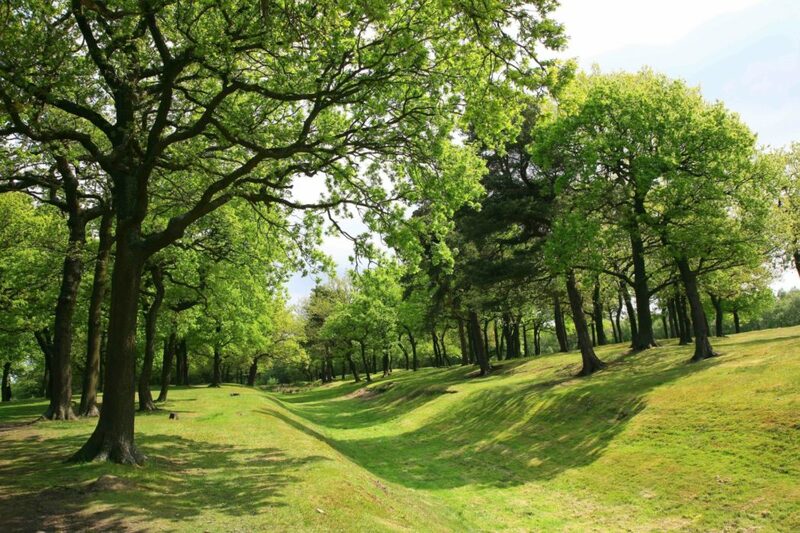 Like the better-known Hadrian's Wall to the south, it formed a solid barrier right across the country and was a clear symbol of Roman power and authority. After 20 years or so the Romans retreated. There are quite a few remains of this wall the next day walking towards Falkirk and the Falkirk Wheel, a monument to modern engineering. I literally walk round the corner on the Forth and Clyde Canal and there, way below, is the Grand Union Canal and the mechanism that transfers boats from one canal to another. It has reconnected the two canals for the first time since the 1930s as part of the Millennium Link project. Until 1933 there had been a flight of 11 lochs that took nearly all day to negotiate. 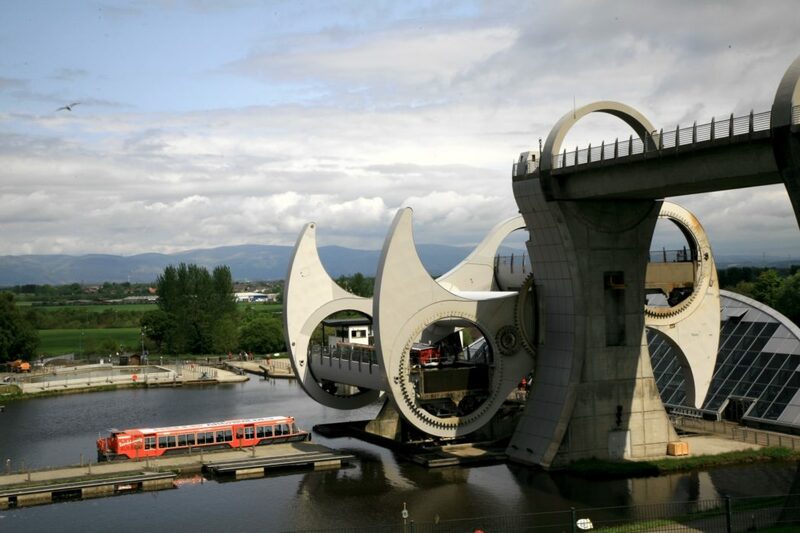 There is a great visitors centre where you can gawp at it, and you can take a local bus to visit the beautiful ‘Kelpie’ statues nearby, not actually on the walking route. The way then descends into Falkirk, resonant with the history of two battles, one in 1746 when Bonny Prince Charlie won and one in 1298 when William Wallace was defeated by the English. 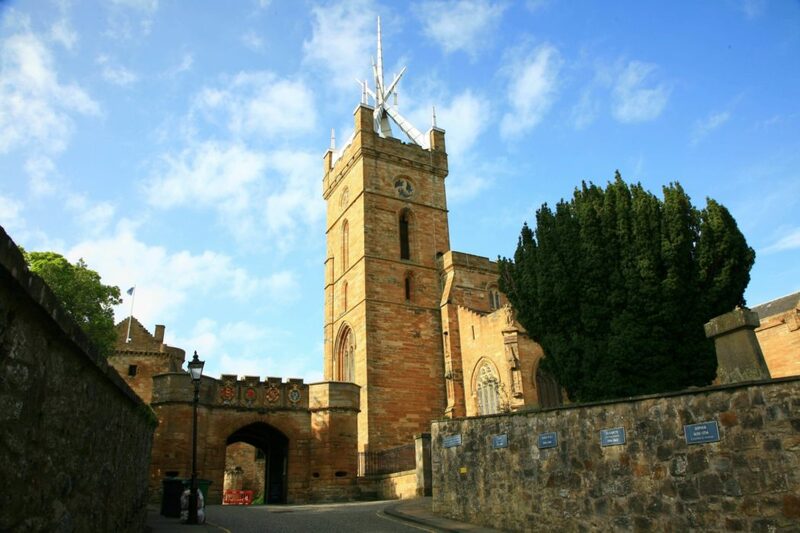 The following day is a shorter one, mostly following the canal to the beautiful town of Linlithgow, home to an ensemble of buildings from the 1400-1700s, a process started by King James I who rebuilt the palace as a grandresidence for Scottish royalty. In fact, Mary Queen of Scots was born here in 1542. The Church of St Michael immediately to the south of the palace has a modernistic aluminium spire. All except the church are in ruins today, but they are still substantial structures. The ornately carved fountain in the palace courtyard was said to have flowed with wine when Bonny Prince Charlie came this way, and the fountain at the town cross was said to have been carved by a man with only one hand. The beauty of the town is rather marred, in my opinion, by the 1960s construction of grey flats on stilts, which appear incongruous with the rest of the architecture. The John Muir Way then follows the Fisher Row, a walk used historically by wives of fishermen travelling between Bo'ness and Linlithgow to sell their catches. At Bo'ness I rejoin the coast on the Firth of Forth and soon can see in the distance the iron skeleton of the extraordinary Forth Railway Bridge, whose 1890 design inspired Gustav Eiffel. In between I pay a visit to remarkable Blackness castle, which is shaped like a ship with a sharp prow. It was still being used in World War I. After a ‘running of the deer’ experience crossing the extensive Hopetown Estate, I stay in the same inn where Robert Louis Stevenson conceived Kidnapped. I think about knocking on his door, No 13, to see if he is still there. Trains rumble overhead along the bridge high above South Queensferry, and the ‘Haar’ – a convectional sea fog – rolls in to recreates a Jack the Ripper-style townscape. 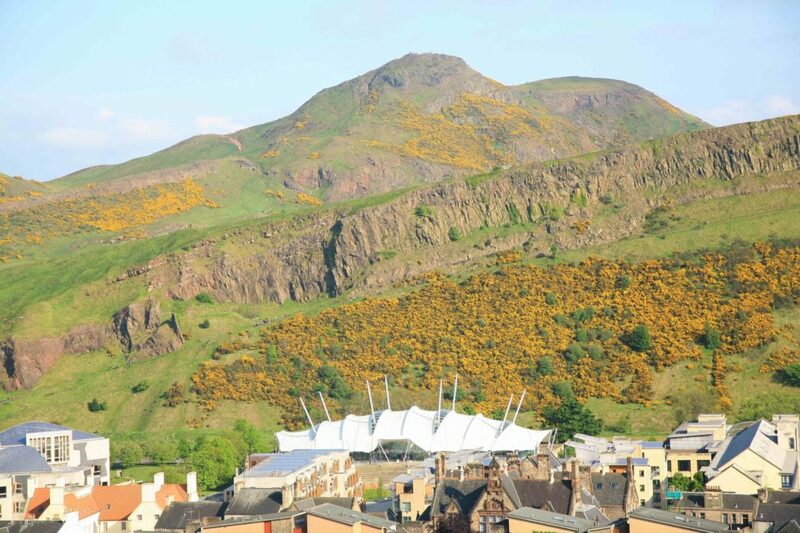 The trail then spends a day passing through Edinburgh, with the chance to go off route to ascend Arthur’s Seat among the golden gorse strewn crags to get a grandstand view of the city. Walking the John Muir Way, however, the centre is slightly bypassed meaning that, take it or leave it, an extra day is really needed to see the city. The walk then takes you straight to the coast at Musselburgh, following coastal paths and road to Preston Pans near where Bonnie Prince Charlie and his Jacobites had his last major victory against government troops in 1745. The seascape here has been a bit sanitised after the coal mining, salt panning and shipping days, meaning that cars apart, when I walk into the pretty, traditional fishing villages of Cockenzie and Port Seton, one can think of how it may have been before the Industrial Revolution. However, there are very few fishing boats left today and most of them catch crabs and lobster rather than fish. I sit at Port Seton under a blazing sunset eating some very fine fish ’n’ chips with splashings of vinegar and, after a couple of jars at the pub, I stay in a terrace of former fisherman’s cottages. Walking from here to North Berwick I was a bit disappointed initially by the amount of road walking. Surely John Muir would have been away through the trees or across the fields? However, after lunch one hits the sea passing the charming village of Aberlady, and a whole succession of golf courses. 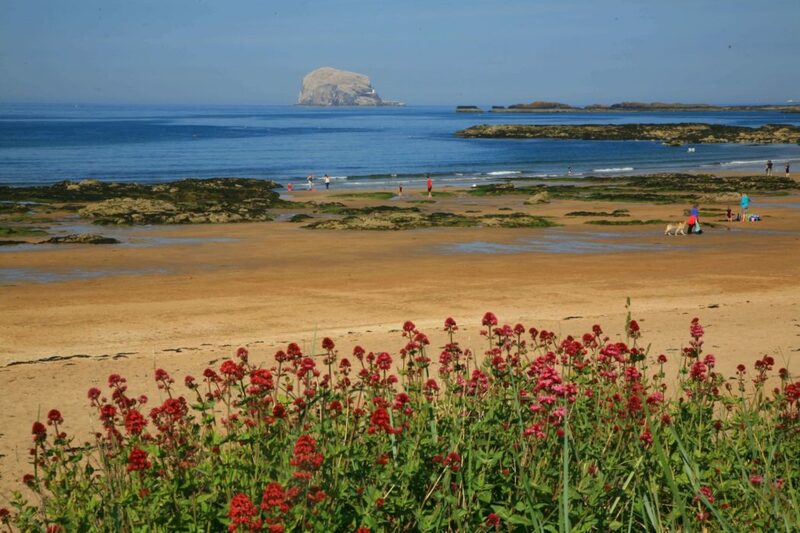 At the beach at Yellowcraigs at low tide you can stroll all the way to beautiful North Berwick along the golden sands, or take the back dunes and golf courses into the town. 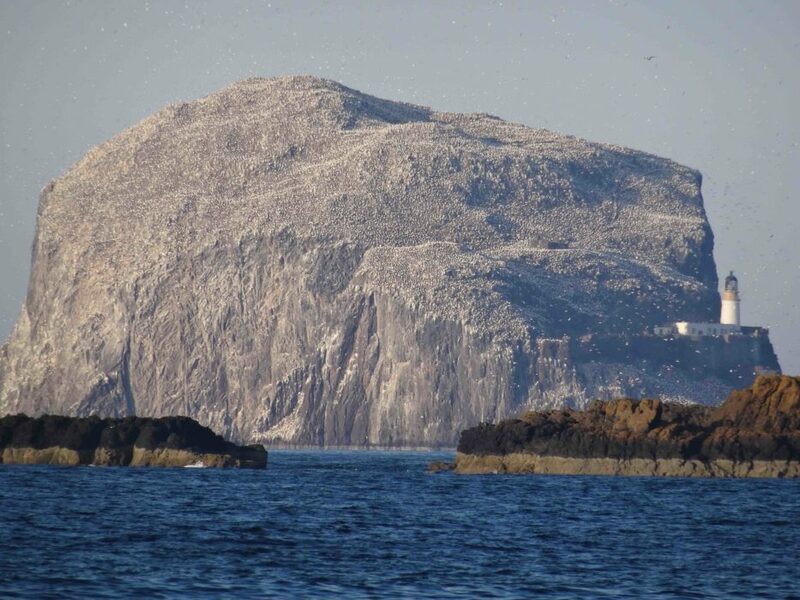 Here you discover another charming harbour and a sea life centre, with views dominated by the Bass Rock Gannet colony, a huge volcanic plug that looks like a cake covered with icing. In this case though it is Gannet Guano! The last day walking the John Muir Way is very agricultural, but full of interest, cutting inland from North Berwick. I ascend the final steep hill – North Berwick Law ­– a volcanic plug with a fibreglass whale bone ensemble on top, which is an environmentally sound replacement for the old whale bones that poked from the summit over the centuries. The view is outstanding, as is the middle aged woman in the pink jumpsuit who is running up and down the Law eight times! This must be the spirit of John Muir. The Way goes inland joining a winding river called The Tyne at East Linton, and then walking out to the coast reaching – at last – an association with our hero, the ‘John Muir Country Park’. He would have known the beaches and dunes here very well. Then the John Muir Way traces across the bay to the village of Belhaven, long associated with Scottish brewing, before its final dalliance with the coast and into Dunbar, where I get my free completion certificate from the museum. Speaking to the locals at B&Bs and the museums, it is clear that the route is gaining popularity, and is attracting growing numbers of North Americans, who have backpacked the famous John Muir Trail in the US. They seem perhaps a bit bemused when they hike the rather less wild John Muir Way. 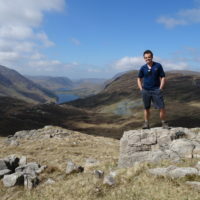 It has to be said that John Muir probably had few connections with any of the route other than the immediate vicinity of Dunbar, North Berwick and Helensburgh. However, it was the stormy seas, flights of birds and the freedom of nature had on him during his escapes from his bedroom window that affected him for the rest of his life and the idea of the John Muir Way is to impart a spirit of adventure on all its walkers.